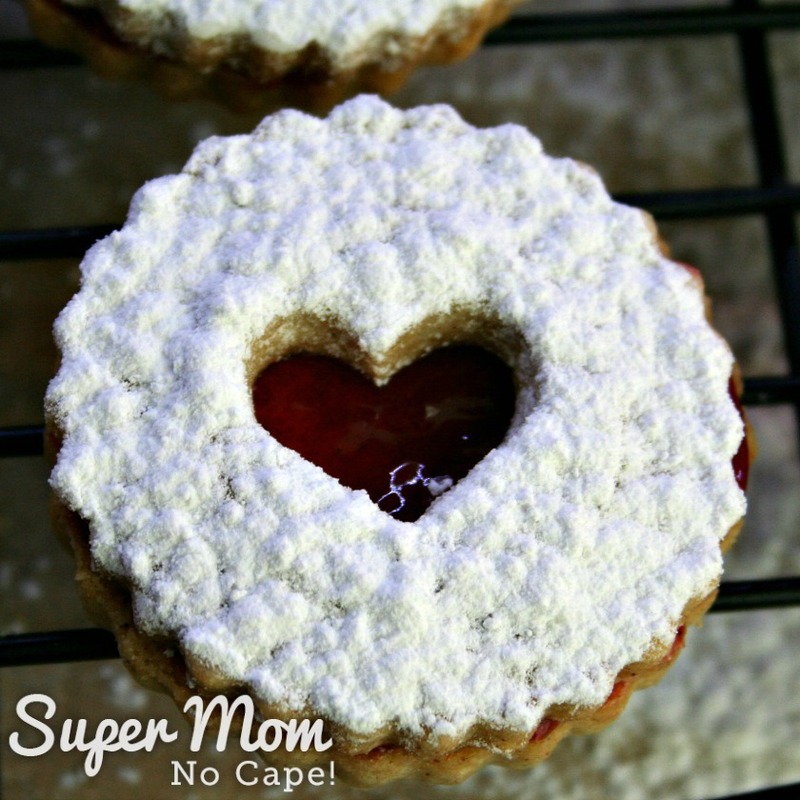 Snow Storm Linzer Cookies - Super Mom - No Cape! 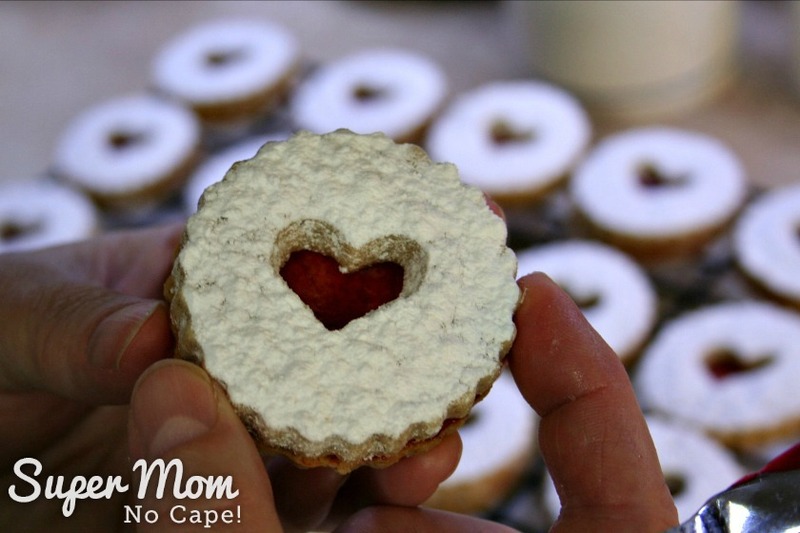 The first time I made these Snow Storm Linzer Cookies was for Valentine’s Day a couple of years ago as part of A Hexie Turtle Valentine story. 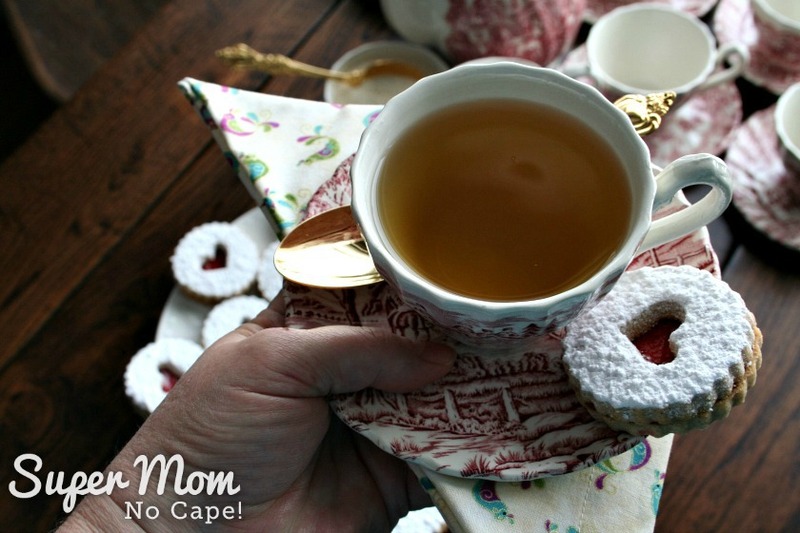 I started with a recipe for Linzer Cookies found on the Canadian Living website. However, I needed to make some changes based on what I had on hand. Ground almonds were substituted for hazelnuts and the lemon peel called for in the original recipe was omitted. The cookies turned out great even with the substitutions/omissions! The cookies themselves have a nice light, not too sweet taste and with that hint of raspberry filling and dusting of icing sugar, they are delicious and elegant enough to grace any dessert tray. 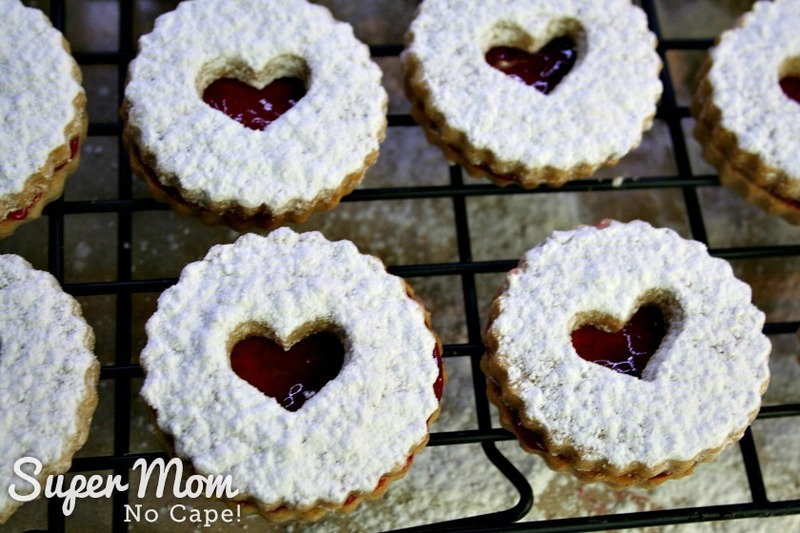 It’s ironic that when we were making them for Valentine’s that year we were in the middle of a snow storm, hence the name Snow Storm Linzer Cookies and we’re once again having a series of snow storms move through. 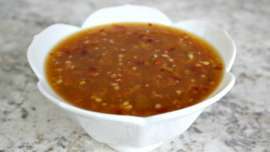 If you’ve arrived after reading the Hexie Turtle story, you’ll already know how to make them and will be looking for the recipe. Please scroll down to get that. But on the chance that you’ve arrived from Pinterest or some other site, I’ve listed the directions along with the ingredients at the bottom of the post. Once you’ve got the recipe, I’m sure the little ones in your life would love to have you read them the story of how the Hexie Turtles get ready for Valentine’s Day. No matter how you arrived here, I thought it would be such fun if I invited you in for a tea party. 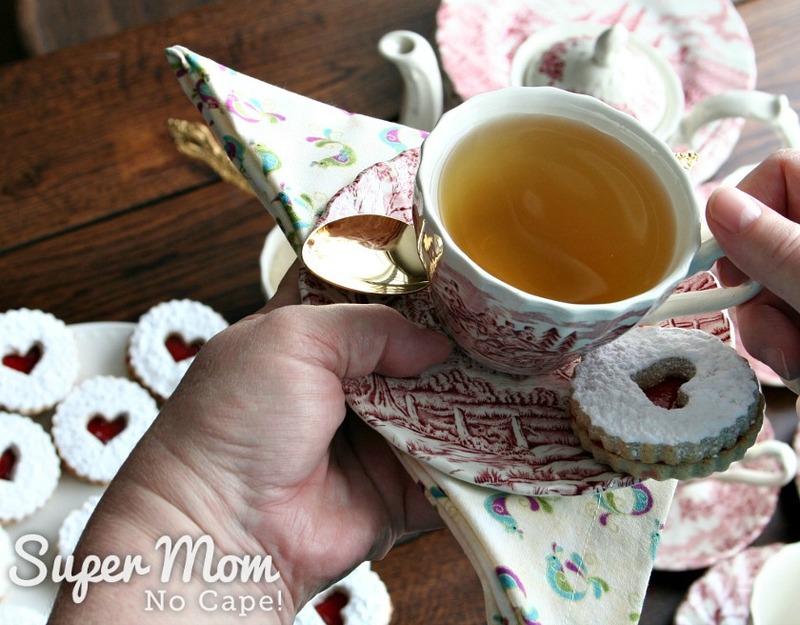 When Dave was in the army, I hosted a lot of tea parties and I must admit that it’s something I miss doing! The day before the party, I’ll bake the tops and bottoms of the cookies and allow them to cool. 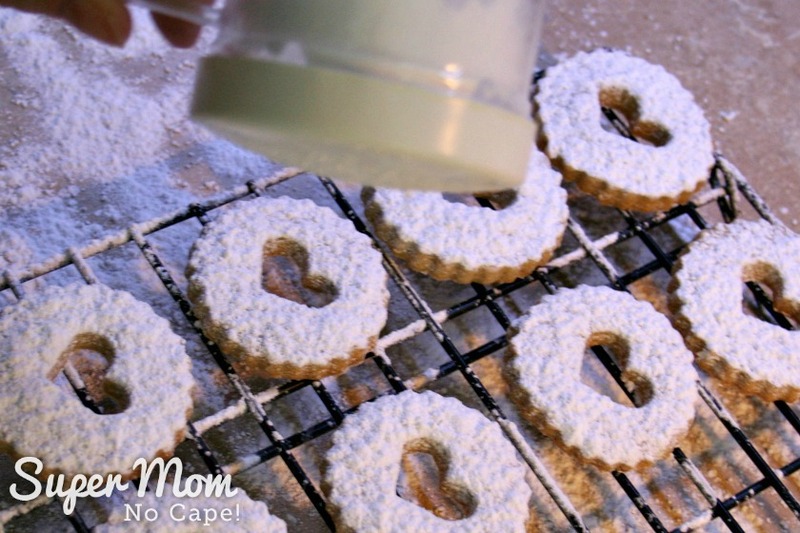 Then the tops of the Linzer Cookies will be sprinkled with a layer of icing sugar so they look like they’ve been covered in snow. Then the bottoms will be spread with raspberry jam. Next the tops will be placed on the bottoms. Now we all know that cookies don’t always cook evenly and sometime they’ll turn out a little lopsided so I’ll try to match up the tops and bottoms so that they fit together perfectly. This recipe makes about 24 finished cookies so if all of you who’ve been invited decide to come, I’m going to be making a lot of cookies! I love how the red raspberry jam showing through the heart cut-out looks like stained glass. 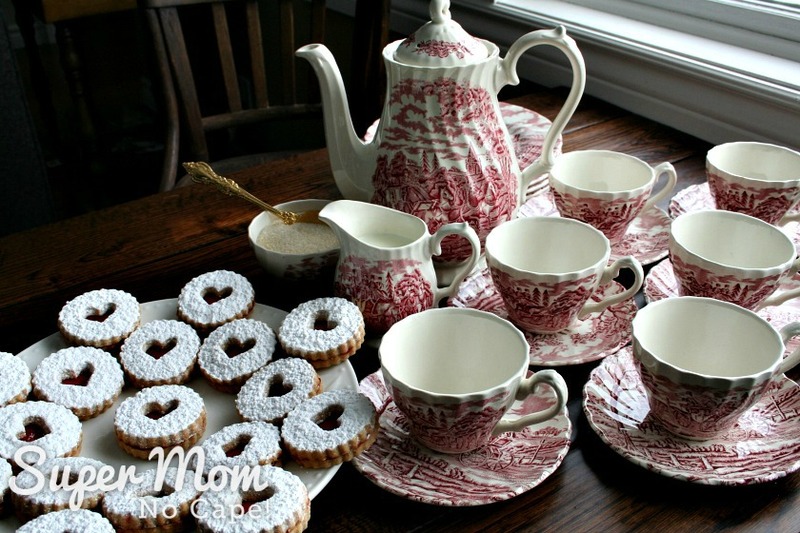 On the day of the tea party, I’ll bustle around straightening the house and getting it ready for company. Once you and the other guests start to arrive, I’ll show everyone into the living room where I’ve set things up for our tea party. As it’s a special occasion, I’ve gotten out the beautiful tea set, made in England, that Dave bought for me when we were posted to Lahr, Germany in the mid 1980s. When we were posted there, I had hoped to have the chance to visit England as that’s where my maternal Grandfather and paternal Grandmother were born but it wasn’t meant to be so this set is a souvenir from a place I never got to see. After everyone has their own cup of tea and cookies and has found a seat, I’ll pour one for myself. Now we can all have a nice visit! 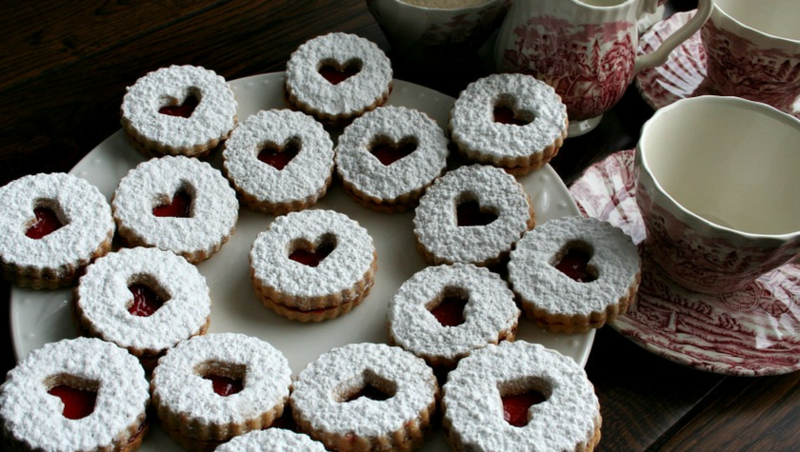 Then before you leave, I’ll give you and each guest a hand written recipe card for the Snow Storm Linzer Cookies so you can make some for your family and friends. I’m so glad you could come share a cup of tea, some cookies and a nice get to know each other chat! Cream the butter and sugar together with the mixer set to medium until light and fluffy. Add egg and egg yolk and vanilla. Beat until combined. Add spices, salt and baking powder to the flour. Stir to mix. Add the almonds. Stir to combine. The dough will be quite sticky. Divide the dough in half. Place on a piece of plastic wrap and gently pat into a disc that is about 1″ (2.5cm) thick. Cover with plastic wrap. Repeat with other half of dough. Chill for at least 2 hrs. Roll out the dough on a lightly floured surface until it’s about 1/4″ (5mm) thick. 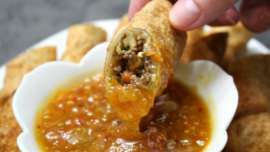 This can be easily achieved by placing a chopstick on either side of the dough and then continue to roll until the rolling pin rests on the chopsticks. I bought this set with a coupon at Joanne’s. You can also get one from Amazon by clicking on the link above. I store my set in the packaging they came in so that I don’t lose any of the pieces. This set comes with the round cutter fluted cutter with 6 interchangeable center cutting shapes. 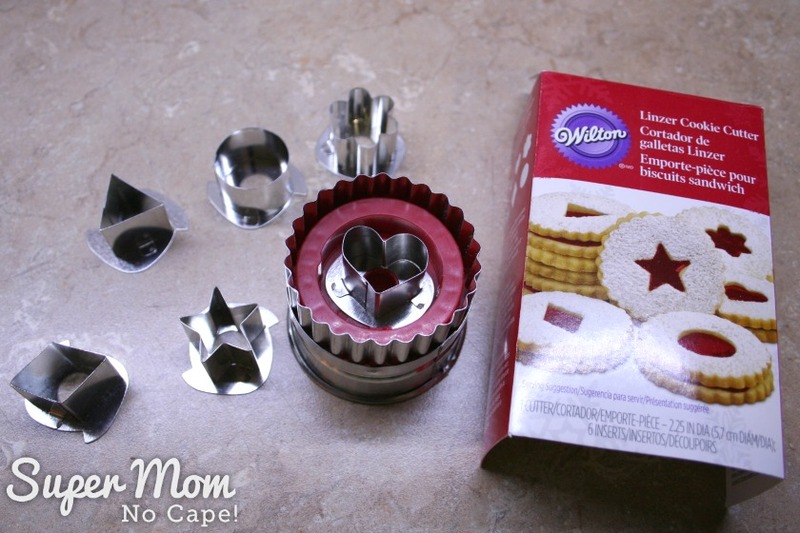 Or use a round cookie cutter to cut the tops and bottoms and then use a smaller cookie cutter to cut the center shape in the tops. 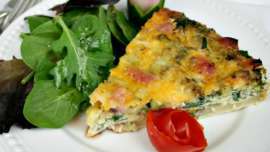 Bake in the oven for 10 to 12 minutes or until lightly golden brown around the edges. Remove from the oven and cool for 5 to 10 minutes before moving the cookies to racks to finish cooling. Once completely cooled… sprinkle the tops with icing sugar. 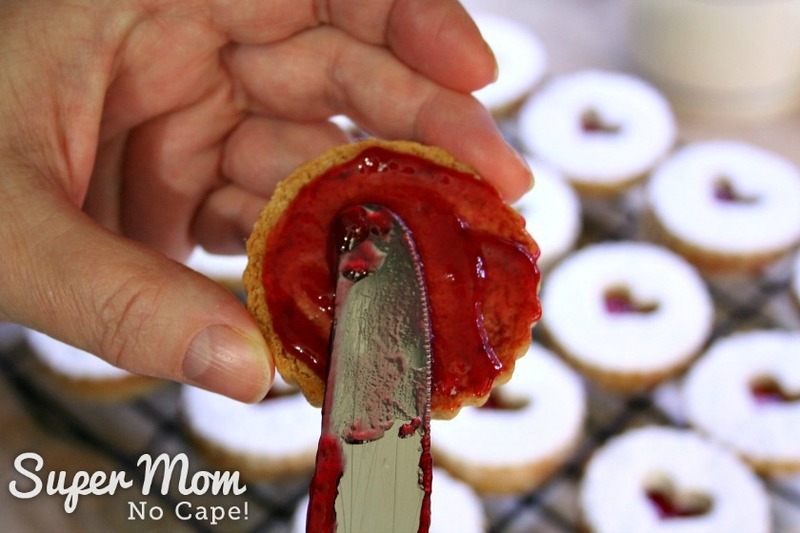 Spread the bottoms with raspberry jam and add the tops. 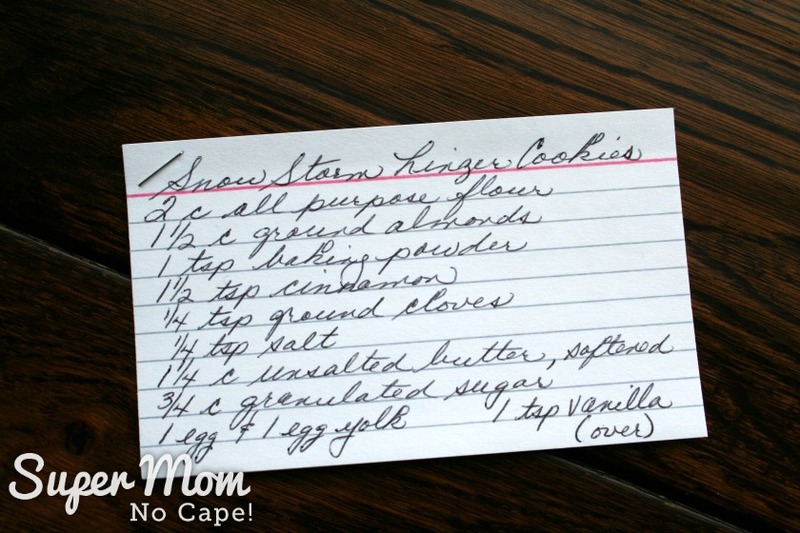 This recipe makes approximately twenty-four 2 inch cookies after they’ve been sandwiched together. 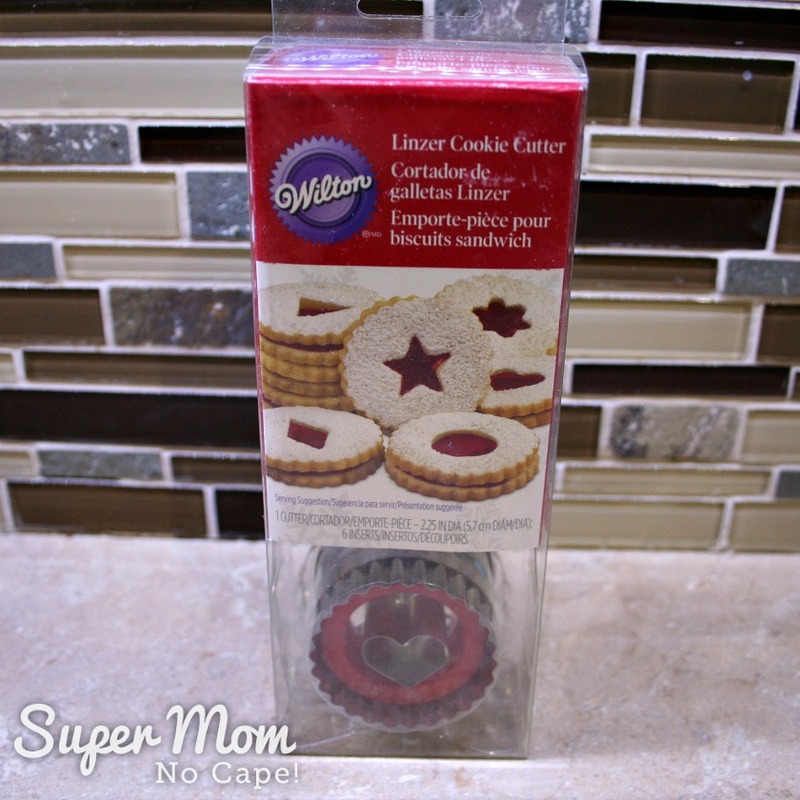 Linzer Cookies will keep up to 3 days (or 2 weeks in the fridge) if layered between waxed paper in an airtight container. 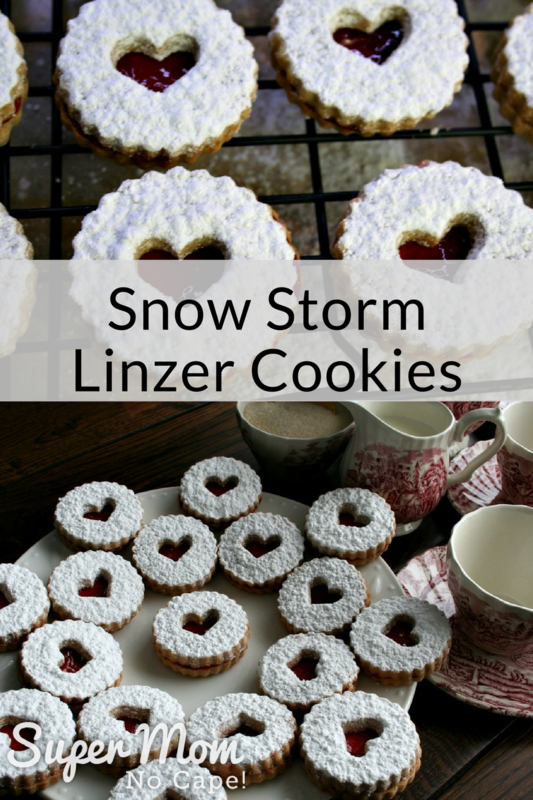 Save this recipe so you can find it when it’s time to bake up some Snow Storm Linzer Cookies by clicking on the Pinterest button underneath this post. What a lovely teaservice, and a beautiful virtual tea party. I’m about to have a cuppa in your honour! What a sweet compliment and comment, Rachel. Thank you! Those are our “family favorite” cookie for Valentine’s Day. I have always used ground pecans instead of almonds so think I may have to try the almonds this year. Your table setting looks gorgeous! I love the tea set. Let me know how you like them with the almonds instead of pecans please, Mary. These cookies are so pretty! 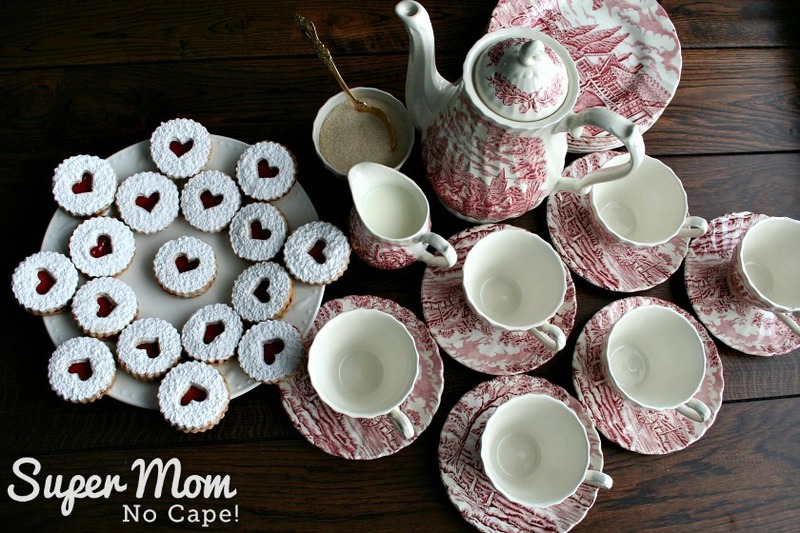 Your tea parties must be so fun and how nice to send your guests home with a special recipe. Thanks for sharing on MM. Pinned. I have made these cookies and nohm nohm nohm, so good. Pinning cuz I love them.